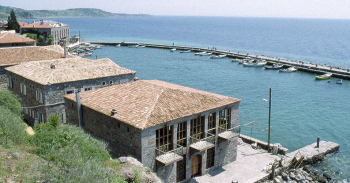 Apostle Paul, after leaving the church at Troas during his third missionary journey, decides that rather than sailing the Aegean Sea he will walk to Assos. His walk to the port city is roughly twenty miles (roughly 32 kilometers). Once in the city he will meet up with the rest of his evangelistic team and sail the rest of the way to Tyre. Paul entered Assos through the Sacred Way among the famous tombs and through the ancient gateway. After meeting up with Luke and company he sails from the city in the hope of arriving in Jerusalem to keep the Feast of Pentecost (Acts 20:16). Paul's course through the Aegean Sea was southwards along the eastern shore of Lesbos. When Assos was lost, Mitylene, the chief city of Lesbos, came gradually into view. The beauty of the capital of Sappho's island was celebrated by the architects, poets, and philosophers of Rome. Like other Greek cities, it was honored by the Romans with the privilege of freedom. Ruins of Ephesus' great theater! Situated on the southeastern coast of the island, Mitylene would afford a good shelter from the northwesterly winds, whether the vessel entered the harbor or lay at anchor in the open roadstead. It seems likely that the reason why Paul's ship stayed here for the night was they wanted daylight to safely sail the intricate navigation between the southern part of Lesbos and the mainland of Asia Minor. Paul and company are soon sailing abreast of Chios (Acts 20:15) and Scio. The weather in these seas is very variable and, from the mode of expression employed by Luke, it is probable that they were becalmed. On one side were the gigantic masses of the mainland while on the other were the richness and fertility of the island, with its gardens of oranges, citrons, almonds, and pomegranates, and its white scattered houses overshadowed by evergreens. The short voyage from Chios to Trogyllium had carried Apostle Paul through familiar scenery. The bay across which the vessel had been passing was that into which the Cayster flowed. The mountains on the mainland were the western branches of Messogis and Tmolus, the ranges that enclose the primeval plain of Asia. The city, towards which it is likely that some of the vessels in sight were directing their course, was Ephesus, where Paul's labors had gathered a company of Christians in the midst of unbelievers. Paul, whose solicitude was so great for his recent converts, could not willingly sail by and leave those in Ephesus unvisited. He would have landed at Ephesus, rather than at Miletus, if it were possible. The same wind which carried him to the latter harbor would have been equally advantageous for a quick passage to the former. And, even had the weather been unfavorable at the time for landing at Ephesus, he might easily have detained the vessel at Trogyllium. Yet every delay, whether voluntary or involuntary, might have been fatal to the plan Paul was desirous to accomplish. Luke informs us here (and the occurrence of the remark shows us how much regret was felt by the Apostle on passing by Ephesus) that his intention was, if possible, to be in Jerusalem at Pentecost (Acts 20:16). Even with a ship at his command, Paul could not calculate on favorable weather, if he lost his present opportunity. Nor could he safely leave the ship which had conveyed him hitherto, for he was well aware that he could not be certain of meeting with another that would forward his progress. He determined, therefore, to sail in the same vessel on her southward course. Paul then sails pass the Aegean Sea island of Samos. His course lay along the eastern shore, where a much narrower "marine pass" intervenes between it and a long mountainous ridge of the mainland, from which it appears to have been separated by some violent convulsion of nature. This high promontory is the ridge of Mycale, well known in the annals of Greek victory over the Persians. At its termination, not more than a mile from Samos, is the anchorage of Trogyllium. Here a night was spent (Acts 20:15), apparently for the same reason as that which caused the delay at Mitylene. Yet the same watchful zeal which had urged him to employ the last precious moments of the stay at Troas in his Master's cause suggested to Paul's prompt mind a method of re-impressing the lessons of eternal truth on the hearts of the Christians at Ephesus, though he was unable to revisit them in person. Paul found that the vessel would be detained at Miletus a sufficient time to enable him to send for the presbyters of the Ephesian Church, with the hope of their meeting him there. Thus, though the stay at Miletus would be short, and it might be hazardous to attempt the journey himself, he could hope for one more interview, if not with the whole Ephesian Church, at least with those members of it whose responsibility was the greatest. Paul's request to meet the Ephesians was doubtless sent immediately after his ship sailed and docked at Trogyllium. He then remained at Miletus waiting for those whom the Holy Spirit, by his hands, had made overseers over the flock of Christ (Acts 20:28). He would then convey to those from Ephesus a warning that would resonate in the church even to the present day. Paul's missionary journey of sailing! Is Rome the greatest empire in history?